The growth of the composite door market has been one of the success stories during the recession in the UK and there is little reason to think that the inroads already made will falter in the coming years. Chris Coxon, Head of Marketing at Eurocell, reports. 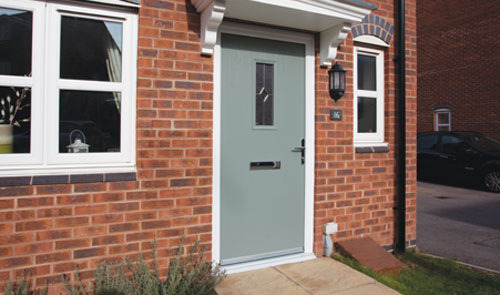 According to latest figures from Palmer Market Research, PVC-U composite doors (including GRP-faced that have easily the biggest share and ABS/PVC faced types) will continue to dominate the UK entrance doors sector. He predicts that by 2019 812,00 units will be produced as opposed to only 286,000 for conventional PVC-U doors, 259,000 for wood and only 23,000 for aluminium. Given such bullish sales, the further tightening of Building Regulations coming into force next month should not be seen as dampening this growth. True, we will see the drive for greater security requirements by law. And yes, there was concern that suddenly surfaced earlier this year when it was realised that the government had decided that manufacturers and suppliers would have to meet national standards. This has been realised in Approved Document Q (AD Q) – effective October 1st – which sets out what it says are “reasonable standards for doors and windows to resist physical attack by a casual or opportunist burglar by being both sufficiently robust and fitted with appropriate hardware”. Nevertheless, greater security, thermal performance and fire resistance have been aspects that have been sold by all reputable composite door manufacturers and suppliers since they started to make an impact on the UK market. Ease of fabricating and installing these products has also seen significant gains for these products. In fact it could be argued that the introduction of doorset energy regulations (DSERs) by the British Fenestration Ratings Council (BFRC) has been an effective sales tool in pushing the need for quality performance over price to the end user – at least for those in the industry who have spotted the advantages. In other words, the fears that greater regulation and compliance would prove a headache for composite door manufacturers and installers should be balanced with the higher bar set that has to be achieved by all players in the market. Security assured vIn the case of the Dales Collection from Eurocell, it features the latest multipoint locking technology, meeting the approval of the Association of Chief Police Officers’ Secured by Design (SBD) scheme and the Police Preferred Specification PAS24. Happily, SBD certification is one way which provides a relatively straightforward route to demonstrate compliance, as it incorporates all the requirements of Part Q.
RP door leaves obviate splits or cracks and are less prone to scratching and denting than steel-faced doors. A high-quality triple-seal frame system ensures composite doors can give outstanding performance for many years and two brush seals and a gasket seal prevent drafts and rain causing problems. While placing an emphasis on performance with composite doors, the aesthetic side should never be underestimated in the equation. End users will be eager for improved performances but if the look of a composite door is seen to be unsatisfactory, either in a clunky appearance, poor finish and garish colouring, sales are bound to suffer. An example of this is the Dales Collection of front and back composite doors from Eurocell that comes in a choice of 12 styles in 15 colours and glazing options, from contemporary ‘chic’ to traditional Edwardian or cottage style. Contemporary, e.g. Anthracite Grey, Slate Grey and Moondust Grey. Standard, e.g. including Rosewood, Golden Oak Frost White and Berry Green. Heritage Range, e.g. Eurocell Cream, Chartwell Green and Duck Egg Blue (all made to order). The Dales Collection doors are also available with colour-matched weather bars.